Sterling Hills Golf Club Hole 1: The opening tee shot of the day is close to the best of the round. The dog leg right par four tee shot must clear a hazard and avoid the two fairway bunkers right. The best drive clears those bunkers, leaving a short approach to the green. The pulled drive will leave a longer approach or catch the deeper left fairway green. The second shot is slightly uphill and the tricky green is well bunkered. Sterling Hills Golf Club Hole 2: Another dogleg right par four, this one really can be played almost straight if the drive is hit close to large tree on the right. Going behind or to the right of that, however, is bad. There are bunkers in the left-center of the driving area and the green is a club uphill with bunkers short and long to the left and a steep slope to the right and short that will reject shots that don't make it up onto the green on the fly. Sterling Hills Golf Club Hole 4: This is an interesting dog leg left par 5. 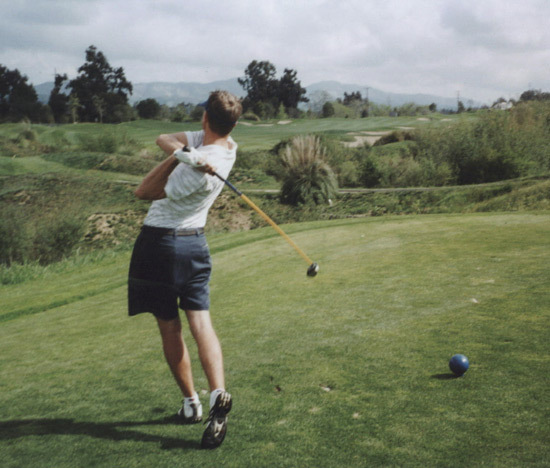 The drive is from a slightly elevated tee with a steep hill left and a row of very tall trees along the right side. 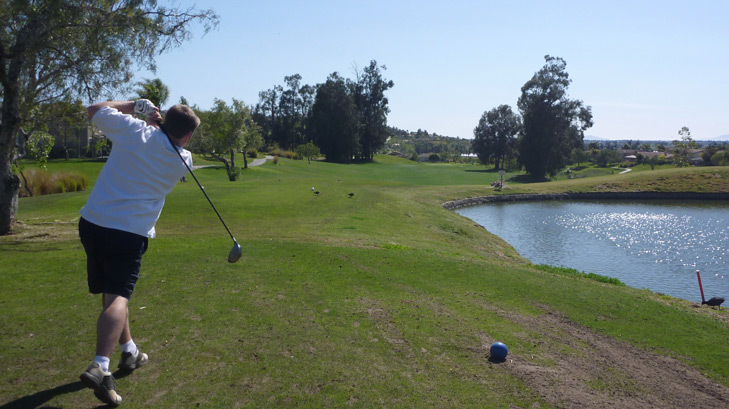 The second and third shots need to avoid the lake right, but the player’s second cannot be pulled too far left or it will leave the approach either blocked by trees or with the ball below the player’s feet, which will create the tendency of a pushed shot right into the water. Sterling Hills Golf Club Hole 5 (left): This uphill par four is long and has bunkers on either side of the fairway. The green is undulating, narrow and well-guarded by bunkers and humps making it tough to find and tough to putt as well. Sterling Hills Golf Club Hole 6 (below): Great hole with trouble everywhere. 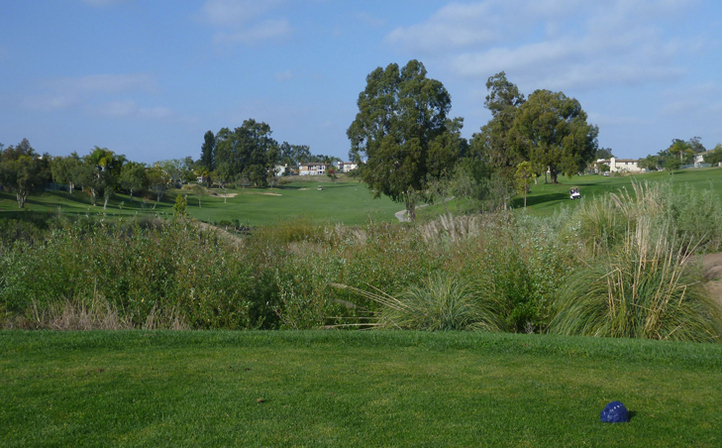 The drive must carry a lake and avoid a series of no less than 5 bunkers right and long/left to find the short grass. The second must also clear a huge bunker short right and another lake short and left to a small, shallow, tiered green. There is no relaxation anywhere to be found, but the hole is short enough to be bested by two accurate shots. Sterling Hills Golf Club Hole 10: The start to the back nine gives the golfer the best chance to hit a passing car as it hugs the street to the right. Other than that, it's a straight-forward par four with lots of bunkers. Sterling Hills Golf Club Hole 12: A strong second shot hole that is set up by the drive, which is uphill all the way. 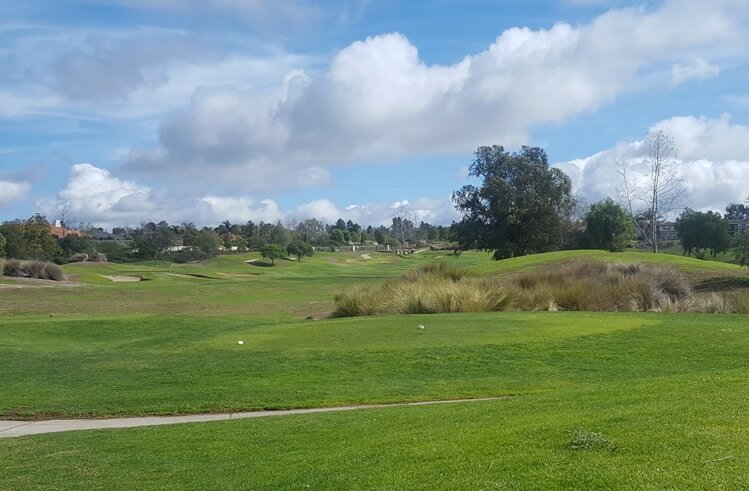 The choice for the player is as follows: play the ball left, near the OB, bunkers and trees to leave a shorter, less intimidating approach shot over the ravine to the green, or play it much safer to the right or short, and leave a much tougher shot to the green. The second shot is all carry over a ravine from which there is no escape. Any pin placement right is extremely difficult and anything short or right is dead. Long is in a bunker where up and down won’t usually happen. The icing on the cake is that the green is triple-tiered and very difficult to putt. 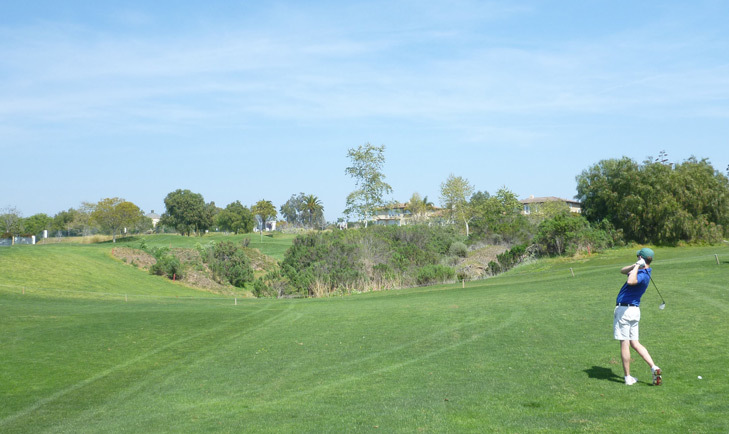 Sterling Hills Golf Club Hole 13: Downhill all the way, the tee shot is wide open, except for the solitary palm tree dead center of the fairway (from the back tees), which, if hit, will dump the ball in the ravine that is otherwise easily clear-able. The second shot is downhill and will most likely be middle iron. But, anything hit left will careen down a hill into a marsh hazard. The green has a tier separating the right side from the left and any putt from the wrong side will be extremely difficult. 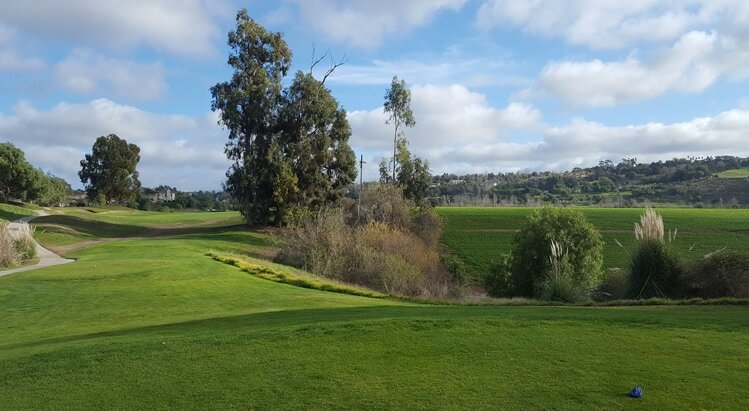 Sterling Hills Golf Club Hole 14: The third difficult par four in a row demand a straight or faded tee shot as the enormous tree to the right of the fairway won't allow a draw. There is OB right (in the form of local Camarillo agricultural fields) and even left for a shot that over-compensates. The approach is downhill to a green where a miss right is in a very deep bunker or OB and a miss left will leave a tough uphill chip. Sterling Hills Golf Club Hole 15 (right): This short par three has a lake very much in play and bunkers front and back that are also troublesome. What adds extra flavor is the large swale in the front right portion of the green. Any pin placement back center right, where the golfer leaves the drive front left will have a crazy putt mini-golf style that has to skirt the edge of the swale. The hole is a little too tricked out for any pin placement other than front-left. Sterling Hills Golf Club Hole 17 (below): An incredibly difficult par four that is impossibly long. 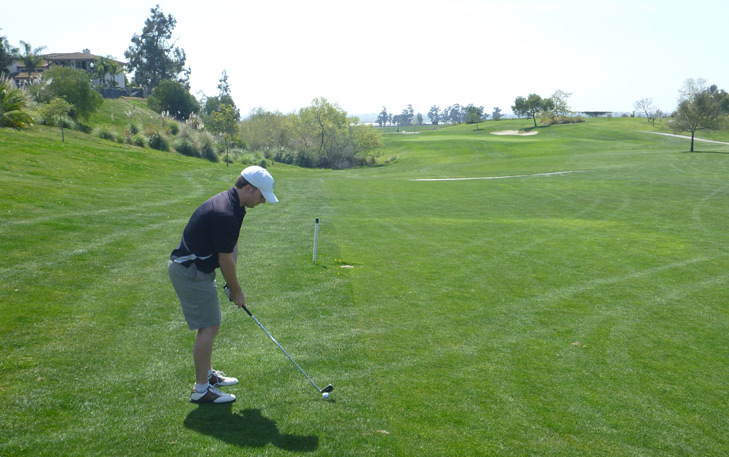 Every shot must be hit perfectly or trees, bunkers, hills, or OB will cause the golfer extreme hardship. Sterling Hills Golf Club Hole 18: The final hole is a unique, uphill par five. It's straightaway for the first shot, the green is tucked left behind a massive series of trees about 100 yards out. 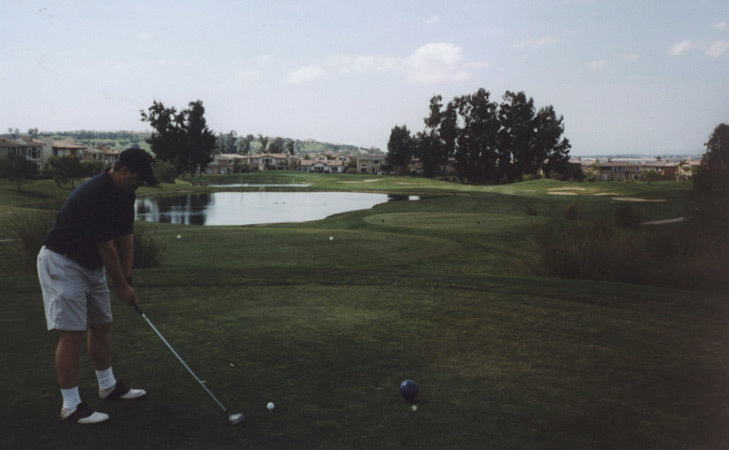 So, the golfer can layup to the right, or try to hit a big hook or very high fade over the trees to get close to the green, which is angled and surrounded by sand traps or little hollows, leaving few even lies.